People travel far and wide to visit these European beaches – and luckily they’re right on our doorstep. From sweeping bays to dramatic blackened sands, we searched the continent’s every nook and cranny for these hidden masterpieces. 2016 is looking better already. 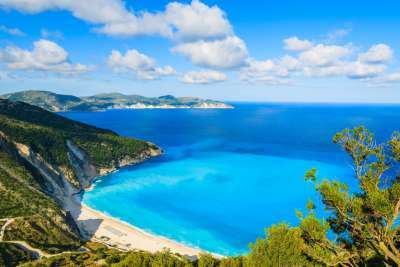 Kefalonia caught the eye of every traveller once Captain Corelli's Mandolin came onto the scene. The novel set the precedent for verdant pines, turquoise waters and blindingly white shores - and Myrtos Beach fits the bill. You could argue it's one of the most photographed beaches in the world. With sheer cliffs in the background, the vanilla-hued shores and cobalt waters seem to stand out even more. Grab a sun lounger in the early hours - local Greeks love this beach too. Those not entirely devoted to a holiday spent beachside will rejoice - in Antalya you can swap between sunbathing and city exploring with very little effort! White sands seem to stretch for days so you won't have to work very hard to find your own patch of paradise. The scenic black and brown Bey Mountains lie to the west, tempting sunbathers to create scenic photo, while there are plenty of dining and drinking places a short, sandy walk away. There's even a marine park and waterpark nearby as well as an open food court, where you can try a taste of chewy Turkish ice cream to cool down during the day. 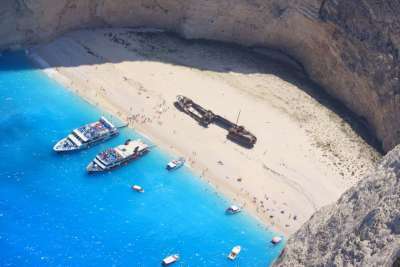 Golden sands and bright blue waters personify Shipwreck Bay. Well, and the remains of the shipwreck lying on its shores. Once a cargo ship that was run ashore by the coastguard in the 1960s, it now adds to the overall atmosphere of this Greek beach. The steep cliffs overlooking the bay only add to the dramatic effect. 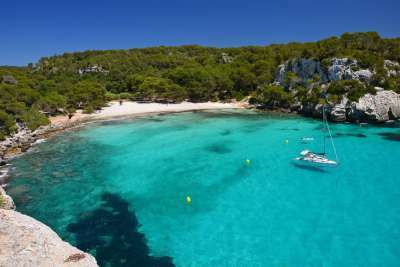 The less visited sister of Majorca deserves far more attention than it gets - Menorca has some of Europe's finest beaches along its coast. Cala Macarella is a horseshoe-shaped cove which lies on the south-western side of the island. Pine-covered cliffs and sugar-white sands are the first things you'll notice in this peaceful cove. Wait until the sky fades into a pink-tinged sunset to truly appreciate its beauty. 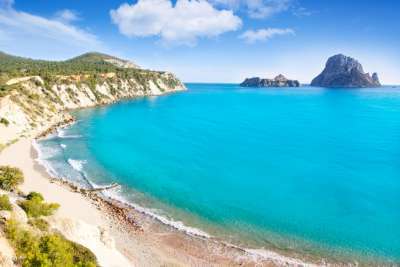 Cala D'Hort's white sand and pebble shores lure more than a few beach lovers. On the extreme south-west of the island, surfers jump into sparkling waters while sunbathers settle into the sand for a day of sunbathing, gazing at the mesmerising view of the volcano-shaped Es Vedra rock in the near distance. Try and spot an Eleonora’s falcon or go to one of the nearby restaurants for a serving of mouthwatering lobster paella. Jaz Beach can be found just outside of Budva, lovingly coined a mini-Dubrovnik. 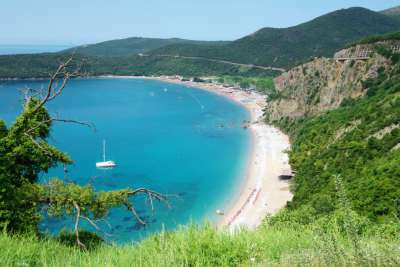 The broad and sandy beach is adjacent to inviting Adriatic waters just waiting to be jumped in. The leafy, pine-fringed shores are also home to Sea Dance Festival. This summer the party kicks off on the 14th to 16th July. Don't miss it! 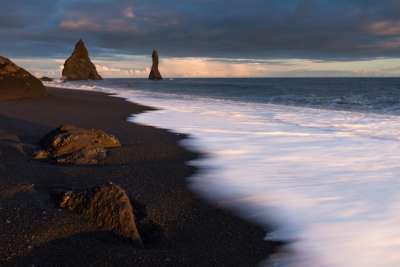 Those who can't get enough of atmospheric, dramatic shorelines shouldn't miss out on a chance to experience Vik Beach. Just a short day trip from Reykjavik, Vik Beach has stormy black sands, ethereal mists and is haunted by tales of trolls and sea monsters. The Trolls of Vik (which are actually stalks of basalt) stand tall to the west while caves composed of cooled lava beckon to be explored at low tide. Keep your eyes peeled for the sight of a few puffins who call this mystical land home. Aptly-named Golden Sands fulfils your expectations - just don't come here looking to get away from the crowds. Its purest sands and clearest waters have brought in the sunbathers and they're here to stay. They've also got a casino, mini-golf, water parks, fairground rides and a smattering of bars to encourage them to stay. You know it's the picturesque beach that keeps them coming back for more, however. Croatia has long been a destination for the yacht-setters - its crystal-clear seas and stunning islands catch their discerning eyes. 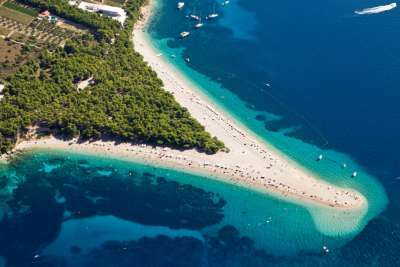 Zlatni Rat, in particular - its shingle beach extends into the clear, turquoise water like a finger formation and its views are worth the adoring crowds. It serves as the poster child for beautiful beaches in Croatia by countless brochures and travel guides. Fly into Split and make your way to Bol via boat - it's walking distance from there. Mellieha Bay is Malta's longest sandy beach by far - and one of its loveliest. At 800 kilometres long, expect white sands and transparent blue seas. You can add Mellieha Bay's well-deserved Blue Flag status to the many reasons we love it. Beachside cafes and bars offer a respite from sunny skies but if you really want to cool down try out the many offerings of kayaking, waterskiing, windsurfing and banana boating. The enticing blues of the water are as lovely to swim in as it is to look at. Temperatures remain warm enough to swim most of the year.